This beautiful Sansevieria plant is native to Madagascar and Southern Asia. Also known as the snake plant, this makes a perfect gift to celebrate any special occasion. The plant is exceptionally easy to look after only requiring watering once every 2 to 6 weeks. There are also excellent health benefits involved with this plant, unlike most plants that take away oxygen at night, this one gives brings it back! We have also included a designer pot to give this plant a perfect presentation. It is one of the hardiest of all potted plants which means that this is a gift suitable for all recipients. The rich green appearance of this plant and its unusual shape makes it a true attraction in any room. They are especially easy to care for. So, you don't have to worry if the intended recipient has no plant care experience. 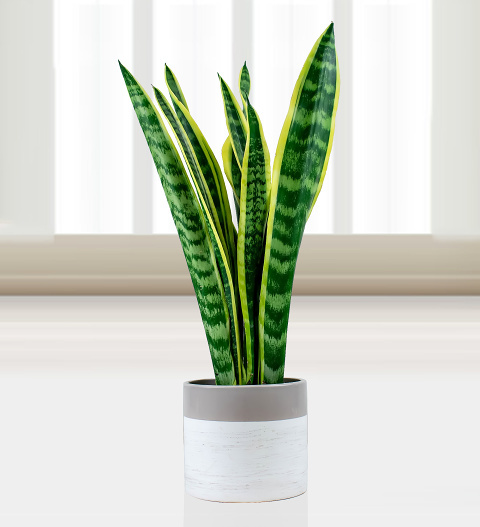 Whether you want to wish them a happy birthday, congratulations, or even if you are looking for the perfect housewarming gift, you can't go wrong with our Sansevieria plant!